Since I'm mainly doing reviews over on Blasterhub...why not look more in-depth at the inside of things here? It's not being put to use at the moment, anyway. The Prometheus is very much an elongated Nemesis, with extra long agitator and conveyor belt, in order to accommodate the increased rate of fire. If you've rewired a Nemesis, you're doing essentially the same thing here in terms of modifications. Each motor has a board soldered on it, etc. 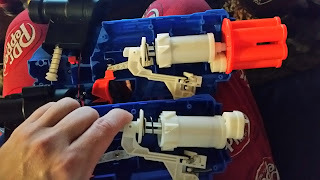 In the case of the Prometheus, however, the wires are a LOT longer, especially with the firing controls up on the rear handle. 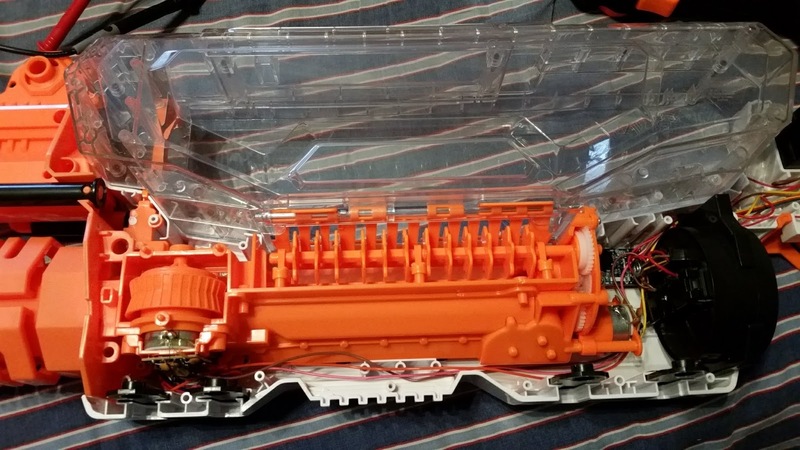 This is one of those cases where, if you have MOSFETs available, I wouldn't blame you for not wanting to rewire everything in the rear handle. Trademark and Patent Search Update - New Things for 2018! Apologies for leaving this blog blank. Long hours and lots of wars mean I have to more selectively choose where to upload info. While I've planned on doing things here, at Blasterhub, and on my Youtube channel, life has simply prevented me from uploading as much content as I have. So I decided to go with the option that (currently) has the best outreach, Blasterhub. Also, I still enjoy writing too much compared to doing videos. Now for the trademarks that have been popping up! I'll list each one, what it's described for at the United States Patent and Trademark Office, and filing date. 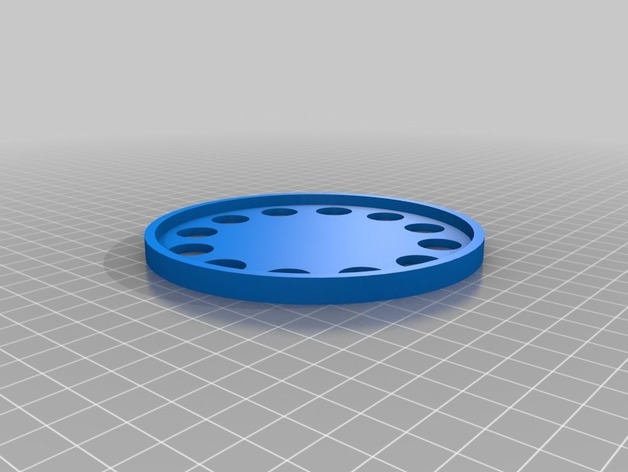 I'll try to avoid listing things also on this Blasterhub post. 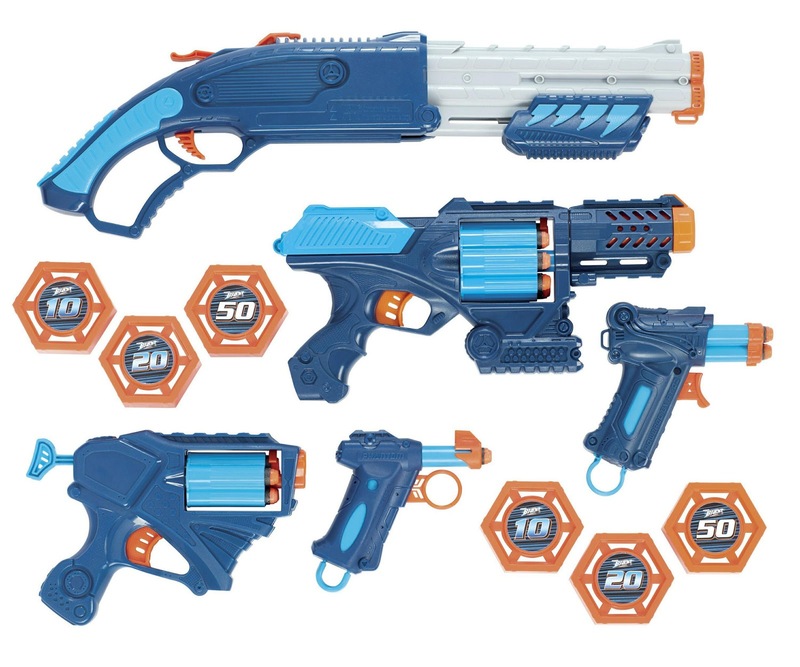 Prime Time, which makes both dart blasters and soakers, of course has plenty of names to claim. It looks like we have plenty of names to look forward to. 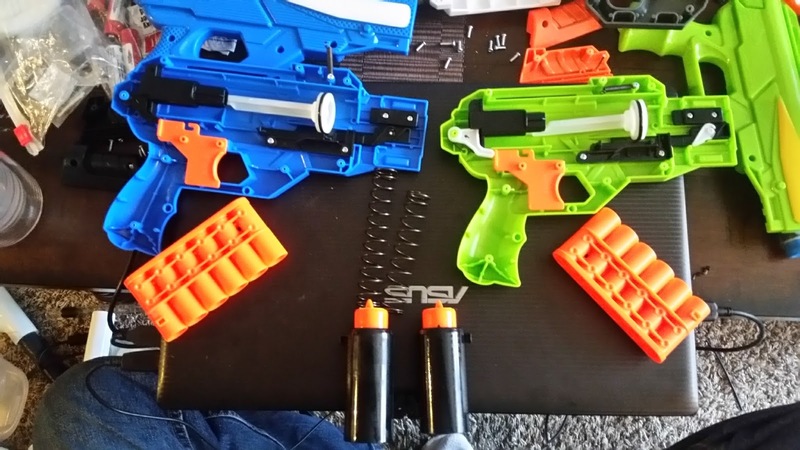 Unknown how many are new blasters, and how many are simply renamed items (for example, Night Assault could just be a Night Tek). In addition, I found the patent for the Monorail. At the Hong Kong Patent Office, I found a patent for what amounts to a piston valve/backpressure system, but with water. 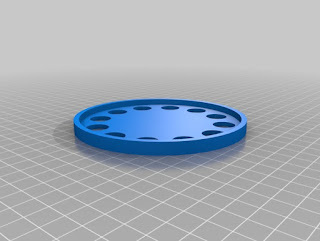 Look under "Specifications" at the link for the English description and pictures. Interestingly, Hasbro officially has the US Design Patent for the Accustrike Dart, as of two weeks ago (filed in October of last year). 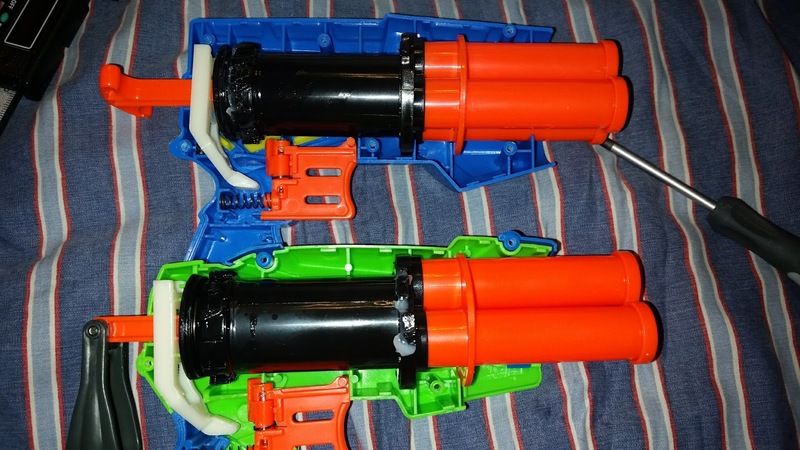 Should be fun to see what happens to all the copies of the dart already online, as "Accufakes" are very popular for the low cost and consistent accuracy out of modded flywheel blasters. Buzz Bee Toys is having a stellar year. 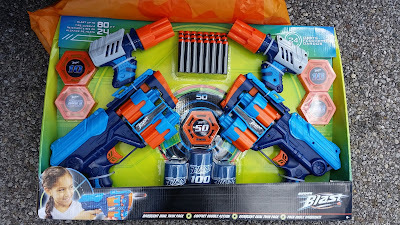 In addition to having new darts for distance and precision, they've managed to infiltrate store shelves with many new blasters. 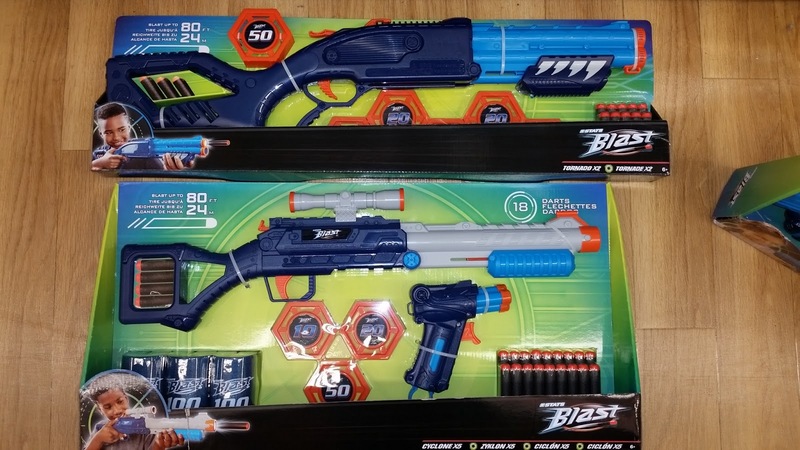 In the case of Walmart, they've even managed to fill out the majority of the "Adventure Force" line with versions of their blasters. New offerings aren't the only thing on shelves, however. Many older blasters (or in a few cases, reshells) have come back, this time with updated range claims. Surely this can't purely be a function of the darts, right? Looks like it's time to open up and compare the different versions to see what differences are inside! The differences at the low end of the updated collection are merely cosmetic. 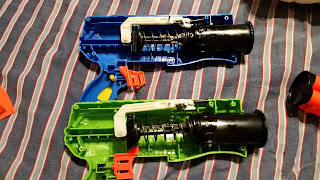 Internally, the old and new versions are the same. These blasters feature larger plunger tubes than the Gem, but generational differences are again in looks, not guts. This blaster is where internal updates begin to appear. As detailed in an earlier post, the Jaguar's Ultra-Tek update featured a brand new plunger tube for hitting the 72' range claims. 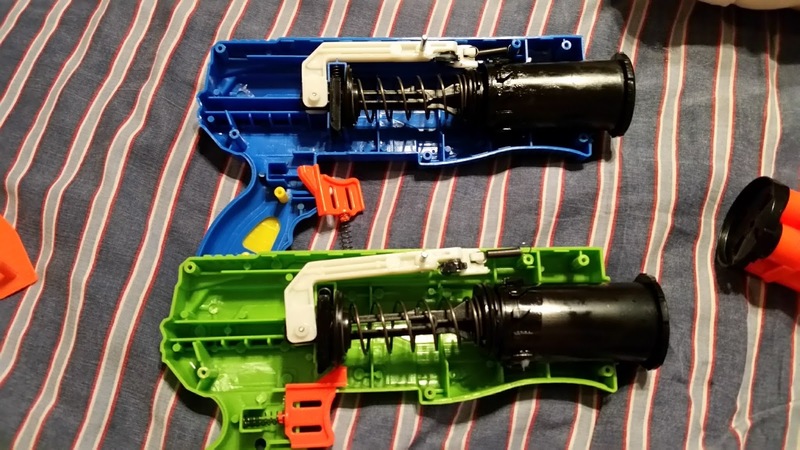 The newest version adds half an inch to the shell, as well as the plunger tube and spring. Here is another blaster that has seen multiple generations. 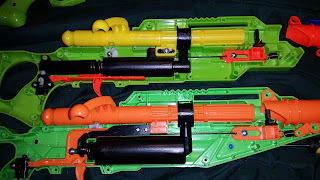 The original functioned like the classic Hunter/Hawk/Rapid Tek with its small plunger and inefficient tubing to barrel connection. The Ultra-Tek update saw a floating plunger tube sitting below and behind the dart. The newest update features an even larger (and stationary) plunger tube. This blaster was left behind in the update; there are no differences aside from shell aesthetics (confetti on the old shell, straight lines on the new). It would seem the lighter Long Distance darts are enough to get the 100'+ ranges. At least some of the time. I'll be looking at the larger blasters next, comparing them to the previous entries (Champion/Reaper v. Tactical Storm, etc).